With the exception of Sir Abubakar Tafawa Balewa, both Presidents Shagari and Obasanjo retained less than 8 per cent of the ministers that they appointed in their first term. We do not know the percentage of ministers that President Buhari will retain in his second term but expectedly he will do it in his own way, in spite of current rumours and innuendos. Only four elected Nigerian leaders have had the opportunity of presenting lists of ministers after re-election. They are Sir Abubakar Tafawa Balewa (1912-1966), first and only prime minister of Nigeria; President Shehu Usman Aliyu Shagari (1925-2018); President Olusegun Obasanjo; and now President Muhammadu Buhari. President Umaru Musa Yar’Adua (August 16, 1951-May 5, 2010) died without completing his first term in office, while President Goodluck Jonathan lost the presidency, while seeking re-election in 2015. With the exception of Sir Abubakar Tafawa Balewa, both Presidents Shagari and Obasanjo retained less than 8 per cent of the ministers that they appointed in their first term. We do not know the percentage of ministers that President Buhari will retain in his second term but expectedly he will do it in his own way, in spite of current rumours and innuendos. The same goes with the appointments of special advisers, senior special assistants and ambassadors. Re-elected presidents are very difficult to predict in their second terms. In 1963, the following were appointed as ministers by Sir Abubakar Tafawa Balewa: Alhaji Muhammadu Ribadu (Nigerian National Alliance; NNA) — Defence, Chief Festus Okotie-Eboh (United Progressive Grand Alliance; UPGA) — Finance, Alhaji Muhammadu Inuwa Wada (NNA) — Works and Survey, Alhaji Zanna Bukar Dipcharima (NNA) — Commerce and Industries and Transport, Alhaji Shehu Shagari (NNA) — Internal Affairs and Communications, Alhaji Yusufu Maitama Sule (NNA) — Mines and Power, Alhaji Ibrahim Waziri (NNA) — Economic Development and Education, and Alhaji Musa Yar’Adua (NNA) — Lagos Affairs. Also, Dr. T. O. Elias (formerly National Council of Nigeria and the Cameroons; NCNC) — Attorney-General and Justice, Dr. M.A. Majekodunmi (no party affiliation) — Health and Information, Chief J.C. Obande (NNA) — Establishments and Labour. More so, there was the appointment of Dr. K.O. Mbadiwe (UPGA), Alhaji Nuhu Bamali (NNA), Alhaji Usman Mitambari (NNA), Alhaji Hashim Adaji (NNA) and Alhaji Ibrahim Tako (NNA) — all as ministers of state. After the 1964 general elections, Sir Abubakar Tafawa Balewa appointed the following as ministers of states: Alhaji Nuhu Bamali (External Affairs), Mr. Jaja Nwachukwu (Finance), Mr. M.T. Mbu (Defence — Navy), Alhaji Usman Maitambari (Transport), Alhaji Hashim Adaji (Works), Alhaji Ibrahim Tako (Defence — Army), Mr. T.E. Orodi (Lagos Affairs), Chief H.O. Davies (Industries), Chief A. Akerele (Information), Alhaji Abdul Razaq (Transport) and Mr. D. Ibekwe (External Affairs). 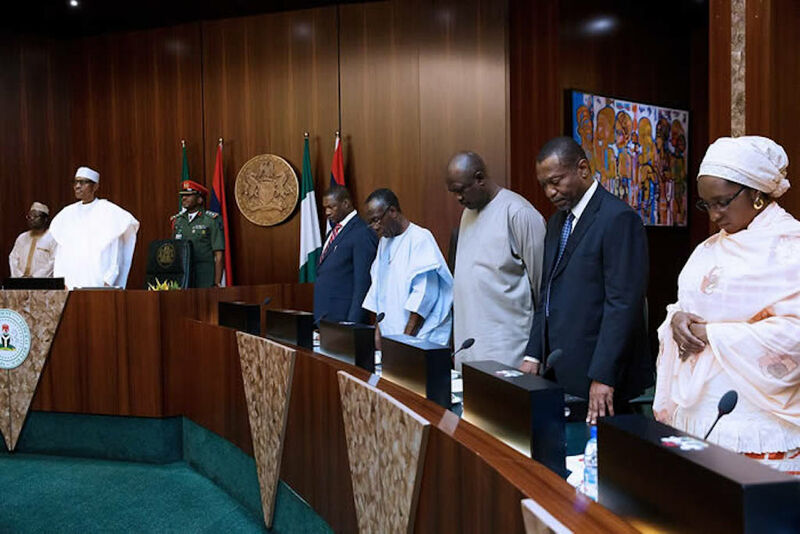 The prime minister also appointed the following as ministers of cabinet rank: Alhaji Muhammadu Ribadu (Defence), Chief Festus Okie-Eboh (Finance), Alhaji Shehu Shagari (Internal Affairs), Alhaji Mahammadu Inuwa Wada (Works), Alhaji Zanna Bukar Dipcharima (Transport), Mr. Raymond Njoku (Communications), Dr. Kingsley O. Mbadiwe (Trade), and Mr. Jaja Nwachukwu (Aviation). In addition, Chief Adeniran Ogunsanya (Housing and Surveys), Chief A.M.A. Akinloye (Industries), Chief Ayo Rosiji (Information), Mr. R.A. Akinjide (Education), Mr. Adeleke Adedoyin (Labour), Mr. Alade Lamuye (Natural Resources and Research), Alhaji Yusufu Maitama Sule (Mines and Power), Alhaji Waziri Ibrahim (Economic Development), Dr. T.O. Elias (Attorney-General and Justice), Dr. M.A. Majekodunmi (Health) and Chief J. C. Obande (Establishments). On Thursday October 18, 1979, President Shehu Shagari wrote to then Senate president, Dr. Joseph Wayas requesting Senate approval for the following as ministers with Cabinet ranks: M. Mohammed Ibrahim Hassan (Bauchi), M. Adamu Chiroma (Borno), Mr. Isaac Shaahu and Mr. Paul Unongo (Benue), Professor Iya Abubakar (Gongola), Alhaji Umaru Dikko and Professor Ishaya Audu (Kaduna), Alhaji Bello Maitama Yusuf (Kano), Alhaji Akanbi Oniyangi (Kwara), Alhaji Ndagi Mamudu (Niger), Mrs. Adenike Ebun Oyagbola (Ogun), and Mr. Samuel Adebisi Ogedengbe (Ondo). Equally, Chief Richard O. Akinjide (Oyo), Mr. John Jatau Kadiya, Mr. George Baba, Hoomkwap (Plateau), Mr. Victor Masi (Rivers), Alhaji Ibrahim Gusau (Sokoto), Mr. D.C. Ugwu and Mr. Chimezie Ikeazor (Anambra), Professor Sunday Matthew Essang (Cross River), Mr. Israel Amadi Emina (Bendel), Dr. Sylvester Ugoh and Dr. I. I. Maduike and Dr. Wahab Olaseinde Dosunmu (Lagos). President Shagari also submitted the names of the following as ministers with non-cabinet rank: Alhaji Ahmed Musa (Bauchi), Chief P. Bolokor, Alhaji Asheikh Jarma, Alhaji Ali Baba, M. Iro Abubakar Dan-Musa, Alhaji Bilyamin Usman (Kano), Mr. Ademola Thomas (Lagos), Chief Olu Awotesu (Ogun), Chief Mrs. J. Akinrinade (Oyo), Alhaji Ahmudu Nahuce (Sokoto), Chief E. Okoi-Obuli (Cross River), Mallam Mamman Ali Makele (Kwara), Mr. Cladius Agboola Bamgboye (Ondo) and Dr. Jakiri Igbani (Rivers). On October 17, 1983, the re-elected President Shehu Shagari submitted his list of ministers to the Senate for approval, presided over again by Dr. Joseph Wayas. They were Chief Eleazar Chukwuemeka Anyoaku and Mr. John Nwodo Jnr. (Anambra), Alhaji Sule Katagun, Alhaji Ibrahim Tahir and Alhaji Magaji Mu’azu (Bauchi), Chief J.A. Orhorho and Mr. Ralph Uweche (Bendel), Mr. Audu Ogbeh and Dr. E.Y. Atanu (Benue), Mallam Adamu Ciroma, Alhaji Muhammadu Buhari and Alhaji Haliru Dantoro (Borno), Dr. Simi Johnson (Lagos), and Senator Idirisu Ibrahim (Niger). Futhermore, onthe list was Chief Kehinde Sofola, SAN (Attorney-General of the Federation – Ogun), Dr. Bode Olowoporoku (Ondo), Chief S.M. Afolabi and Dr. Bimbo Akintola (Oyo), Alhaji Hassan Mohammed and Mr. Robert Doshun Gumut (Plateau), Chief Okoi-Obuli and Dr. A.J. Okonno, Alhaji Ali Baba and Mr. Paul Wampana (Gongola), Chief Emmanuel Adiele (Imo), Dr. Umaru Dikko and Alhaji Isma’ila Isa (Kaduna), Alhaji Yusuf Miatama Sule, Alhaji Bilyamin Usman and Alhaji Hamisu Musa (Kano), Dr. Ishmael Igbani and Mrs. E. Diete-Spiff (Rivers) and Alhaji Muhammadu Lugga, Alhaji Idirisu Koko and Alhaji Bala Sokoto (Sokoto). In 1999, following Senate approval, President Obasanjo appointed the following as ministers: General T.Y. Danjuma, Chief Bola Ige, Alhaji Adamu Bello, Dr. (Mrs.) Kema Chikwe, Engineer Mustapha Bello, Alhaji Muhamadu Arzika, Mrs. Boma Bromillow Jack, Professor A. B. Borishade, Alhaji Muhammad Kabir Said, Engineer Mohammed Abba-Gana, Mallam Adamu Chiroma, Professor A.B. C. Nwosu, Chief Kolawole B. Jamodu, Professor Jerry Gana, Chief S.M. Afolabi, Alhaji Musa Gwadabe, Dr. Olusegun Agagu, Professor Turner T. Isoun, Chief Ojo Maduekwe, Col. Mohammed B. Kaliel (rtd. ), Hajia Aishatu M.S. Ismail and Chief Tony Anenih. On July 15, 2003, President Olusegun Obasanjo swore-in ministers, following his re-election, including: Ngozi Okonjo-Iweala, Nenadi Esther Usman, Idris Waziri, Cornelius Adebayo, Franklin Ogbuagwu, Rabiu Kwankwaso, Rowland Oritsejafor, Fabian Osuji, Bintu Ibrahim Musa, Broderick Bozimo, Bala Mande, Nasir El-Rufai, Oluyemi Adeniji, Saidu Balarabe Samaila, and Olutayo Lambo. Also, Alice Mobolaji Osomo, Chukwuemeka Chikelu, Iyorchia Ayu, Abubakar Tanko, Husseini Akwanga, Lawan Gana Guba, Franklin Nweke, Turner Isoun, Odion Ugbesia, Musa Mohammed, Precious Sekibo, Mohammed Musa, Muktar Shagari, Adamu Bello, Bamidele Dada, Rita Akpan, Adeseye Ogunlewe and Saleh Shehu. President Muhammadu Buhari was sworn-in on May 29, 2015 for his first term. He swore-in his Ministers on November 11, 2015. As from June, the nation will be expecting his second list of ministers, following his re-election.